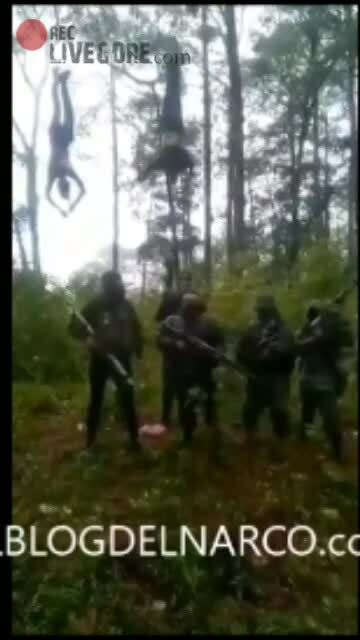 Another video was broadcast, presumably recorded in the Sierra de Guerrero, where "CARTEL FANTASMA" presents two men hanging from their feet in tall trees. During the recording of 1.29 minutes, the group of men who carry long weapons, accuses the victims of belonging to the Southern Cartel and point to work for the criminal nicknamed "El Teniente", lieutenant of the criminal leader Onesimo Marquina Chapa alias "El Necho" . After throwing threats to the opposite criminal group (CDS), the armed men shoot at dozens of times towards the hanging bodies. "El Necho" is designated to finance the group of community suspects who entered the Sierra de Bravo since November 11. The United Front of Community Police of the State of Guerrero killed 13 alleged members of the so-called Southern Cartel, one of them 'El Chaca', who allegedly entered the communities of Filo de Caballos, Los Morros, Carrizal from different points. Filo de Caballos, Los Morros, Carrizal, Airfield and Tres Cruces have suffered a fight for more than two weeks between community police and organized crime men seeking to maintain control of the area.